Just a heads up to any Zapier users. 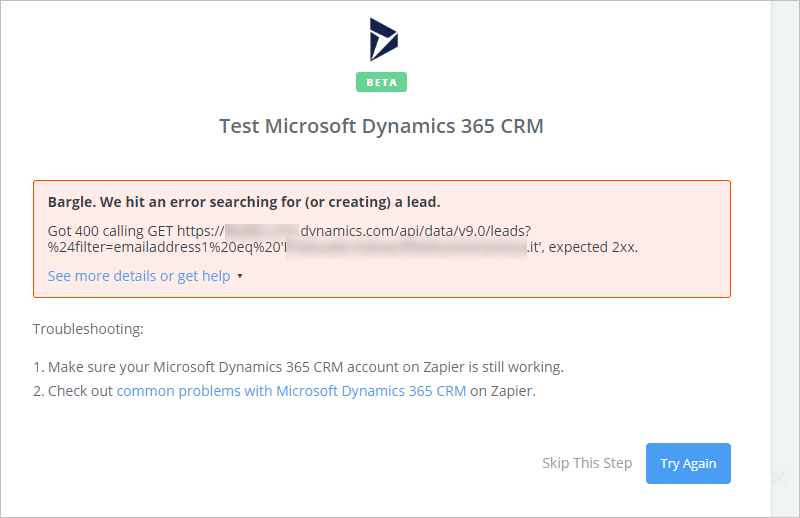 Zapier seems unable to connect to a Dynamics instance that has the April Preview update applied. The standard Find or Create action spits back an error message like the below. Response from Zapier support: Thanks so much for all the testing on your end to get to the bottom of this. I've also looked into our logs and I can see that the error message reads "Number of calculated fields in query exceeded maximum limit of 10", does that point to something for you?" There are more than 10 calculated fields in the leads entity; however, the issue is not appearing with the non-April Preview instances that have the same fields, so it sees to be something specific to the April Preview. I have a ticket open with Zapier and will update here when there is something to report. Perhaps with the April preview, this limit now also applies to OData queries. Maybe you can modify your query to limit the fields it returns. I think you might also want to open a ticket with Microsoft to see if this behavior was meant to change and they need to update the above documentation. I don't think Zapier will be able to do much for you with regards to this error. Thanks for posting. We haven't yet tested, but would like to know your findings as we also use Zapier. Matt - it does seem to be related to the calculated columns limit. As this is an issue with a 3rd party tool, I did not report it to Dynamics support, but I might do now that we have been notified that the April '19 update will be applied at the end of the month. Also - re your suggestion to modify the query - this is not possible with Zapier. Wrt to Dynamics and Zapier, we currently only use it to update leads that have attended a webinar in Go To Webinar. Unfortunately MS Flow does not yet have this trigger. To get leads from website to CRM, we use a Gravity forms plugin from Saint Systems. It's very reliable and robust.